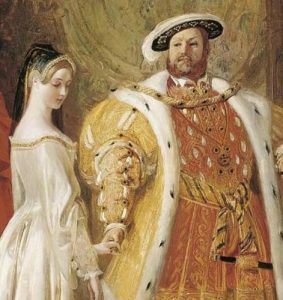 On hearing the news of Catherine of Aragon’s death, Henry VIII cried out “God be praised that we are free from all suspicion of war!” and then celebrated by dressing in “yellow, from top to toe, except the white feather he had in his bonnet”. Edward Hall, the Tudor chronicler, wrote of how it was Anne Boleyn who wore yellow “for the mournyng”, so we don’t know whether Henry wore yellow or whether it was both of them. Henry, however, paraded to mass with his daughter, Elizabeth, accompanied by trumpets. Catherine’s death was obviously something he felt needed celebrating. Henry ordered that full mourning should be observed for Catherine and he sent royal representatives to her state funeral. Well may-be not state, but certainly she had a royal funeral as a Princess of Spain and the widow of Prince Arthur and possibly he still regarded her as his first Queen and the mother of Princess Mary. All the normal masses were said, candles were lit, she lay in state, she had royal bearers and followerers, official mounrners and she had members of the family present. Lady Eleanor Brandon was first mourner at her funeral and she was buried in the then Benedictine Abbey in Peterborough, now the Cathedral. Today of course only a standard flag stone and black stone is over the site, but the Victorians put railings with Katherine the Queen and flowers are left on her tomb. There is the royal standard of UK and the royal standard of Spain and of Aragon and two memorial plaques. A pernament exhibition tells her story. Given all of this and that he is said also to have wept when he read her last letter, I doubt that Henry rejoiced at Katherine’s death. Anne May have worn yellow like a canary, and why we do not know. If it was for mourning, it seems a very odd colour, given that the French wore white and black is a modern Victorian rubbish colour for mourning. The clothing that people chose may have varied and been sombre, but no one colour is known at this time, but I doubt it was yellow. 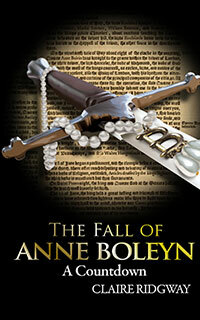 Anne hated Katherine and wanted to poison her and Mary and she delighted in her death. I do not believe Henry wore yellow, but he did express relief at her passing as he was concerned that Charles V of Spain would make war while Katherine was alive and he may have declared thanks that the threat of war now had passed, a natural thing to have done. Henry gets poor press, but he did have some tact and sense and it is not likely that he had yellow on. Anne may have worn yellow, she may have been relieved and as she was also pregnant, perhaps she was overjoyed that her son to be would be born without any more shadows over his legitimacy and her marriage to Henry. As a mother this is also a natural thing to feel as she is protecting herself and her child. It is clear that Elizabeth was shown about and he did celebrate afterwards with a tornament as he fell and was hurt. He then caused everyone anxiety by being out for two hours and may have done damage to his temperal lobs. It is now that he has mood swings and becomes a different person. Henry on his recovery then is very foolish and Anne, and for once I feel sorry for her comes upon him with Jane on his knee. She is already upset from hearing that he had fallen and she believed he had died. Now she has a second shock and oops, she goes into a miscarriage and the boy is born dead. Henry is none too pleased and her downfall is sealed. Whatever celebrations had been going on must certainly have come to a very sudden hault. Thanks for the history. Have you ever heard of Arthur Brandon, illegitimate son of Charles? He is in Barnhill’s book but may be a fictional character. I think he was fictional, but I did love the storyline. Thank you for your very thorough answer regarfing everything, including whether he feted baby Elizabeth or Mary at the time. His conducting of Elizabeth in his arms rather joyfully shows the triumphal joy he took in his beautiful 2 yr old daughter. Mary being allowed to be at the head of procession for her mother Katherine is rather striking and sad. Thank you for also citing your sources on these matters. Was it true that as Katherine was sick for a couple of mths, that Henry prevented Mary from attending her mother as she lay dying?